Congratulations to Rachael Marshall for her new publication in the Journal of Hydrology. The implementation of source water protection programs is relatively recent in Canada and the United States. Although protecting water at the watershed scale has been a focus of many of these programs, few Indigenous communities located within these watersheds are involved in the process. Therefore, we wanted to examine and map the extent, range, and nature of the published peer-reviewed literature on the adoption, implementation, and outcomes of source water protection programs involving Indigenous populations in Canada and the United States. Rachael Marshal led the paper; she is a PhD Candidate in Environmental Engineering at the University of Guelph. She has worked in partnership with Indigenous communities in Guatemala, Nunatsiavut, northern and southern Ontario, and Saskatchewan to promote clean drinking water, appropriate water infrastructure, and healthy socio-ecological systems. The implementation of source water protection programs is relatively recent in Canada and the United States. Although protecting water at the watershed scale has been a focus of many of these programs, few Indigenous communities located within these watersheds are involved in the process. The purpose of this scoping review was to examine and map the extent, range, and nature of the published peer-reviewed literature on the adoption, implementation, and outcomes of source water protection programs involving Indigenous populations in Canada and the United States. This review followed a systematic process to identify and evaluate the literature. Searches were conducted in three aggregator databases (Web of Science™, ProQuest®, and GreenFILE™). Two independent reviewers conducted a systematic two-stage screening process using inclusion and exclusion criteria in the software DistillerSR©. Articles that met inclusion criteria were analyzed using thematic qualitative and descriptive quantitative methods. The findings indicate that: a) there is a lack of peer-reviewed studies focusing on the ecological outcomes of source water protection programs that are inclusive of Indigenous populations in Canada and the United States; b) the depth to which the literature describes Indigenous involvement in source water protection programs is minimal; and c) Indigenous involvement in source water protection programs is generally not reported as substantial. This review provides several recommendations to improve both the peer-reviewed literature on the topic and source water protection programs. There is a need to improve reporting in the literature on quantitative program results, the nature of Indigenous involvement in source water protection programs, and Indigenous-inclusive inter-jurisdictional success stories. It is also recommended that source water protection programs recognize Indigenous peoples as more than stakeholders groups, and that future studies pull from innovations in other fields to address complex problems and provide new insights to the field of source water protection. The methodology presented in this paper provides a template for researchers in engineering and environmental fields, such as hydrology, to identify and review published literature in a systematic, transparent, and rigorous manner. Congratulations to first-author Rob Stefanelli, from Heather Castleden's HEC Lab, on his publication that examines Canadian and Australian researchers' perspectives on promising practices for implementing indigenous and Western knowledge systems in water research and management. Stefanelli, R., Castleden, H., Cunsolo, A., Martin, D., Harper, S.L. and Hart, C., 2017. Canadian and Australian researchers' perspectives on promising practices for implementing indigenous and Western knowledge systems in water research and management. Water Policy, DOI: 10.2166/wp.2017.181. Click here to access the article. National and international policies have called for the inclusion of Indigenous peoples and the uptake of Indigenous knowledge alongside Western knowledge in natural resource management. Such policy decisions have led to a recent proliferation of research projects seeking to apply both Indigenous and Western knowledge in water research and management. While these policies require people with knowledge from both Western and Indigenous perspectives to collaborate and share knowledge, how best to create and foster these partnerships is less understood. To elicit this understanding, 17 semi-structured interviews were completed with academic researchers from Canada and Australia who conduct integrative water research. Participants, most of whom were non-Indigenous, were asked to expand on their experiences in conducting integrative water research projects, and findings were thematically analyzed. Our findings suggest that Indigenous and Western knowledge systems influence how one relates to water, and that partnerships require a recognition and acceptance of these differences. We learned that community-based participatory research approaches, and the associated tenets of fostering mutual trust and community ownership for such an approach, are integral to the meaningful engagement that is essential for developing collaborative partnerships to implement both Indigenous and Western knowledge systems and better care for water. Congratulations to Stephanie Masina (MSc Candidate) for winning second place in the poster competition at the Centre for Public Health and Zoonoses Annual Symposium. Click here to read the OVC Bulletin Story on the Symposium and Stephanie's poster prize. Congratulations to Carlee Wright for Successfully Defending her MSc thesis Research! Carlee graduated with distinction from her BSc in Biological Sciences from the University of Guelph in 2014. She then started her MSc in Epidemiology in the Department of Population Medicine (OVC) and earned a 91% average in her coursework. Outside of her coursework, she was a Teaching Assistant (TA) for the graduate-level Epidemiology I course in 2015, a member of the EcoHealth Community of Interest (2014-present), and an active member of the journal club (2014-present). Carlee conducted community-led research on drinking water quality and safety, led by the community of Rigolet (see thesis abstract below). She presented this research at 3 national and 5 international conferences, including 8 poster and 7 oral presentations, many of which were co-presented with Inez Shiwak (an Inuit research associate from Rigolet). To support her research, Carlee won over $62,000 in scholarships and research grants; her research has taken her to Nunatsiavut, Alaska, Oxford, Montreal, and other locales. It has been an absolute pleasure to work with Carlee over the past few years; she is a great thinker, writer, and analyst. Congratulations Carlee! Canadian Inuit have often reported concerns about the quality of their municipal drinking water. 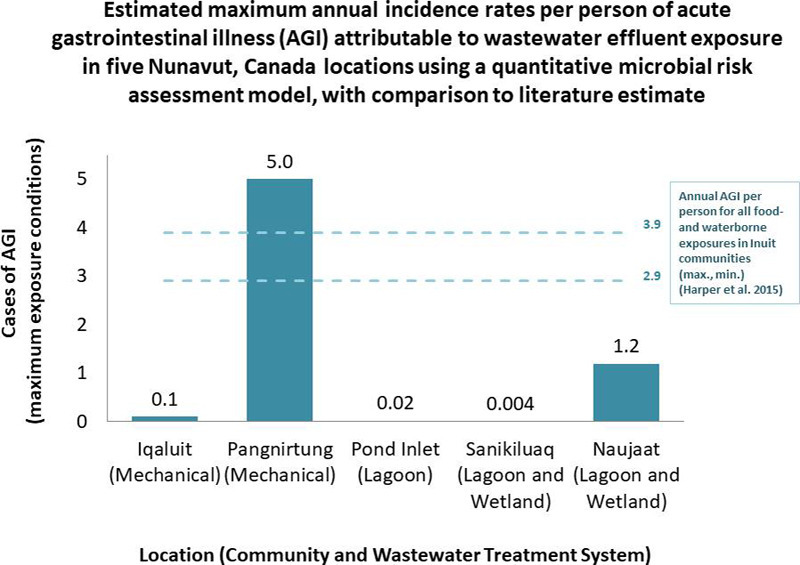 This research took an EcoHealth approach to investigate drinking water perceptions and consumption patterns, as well as drinking water contamination and its potential associations with acute gastrointestinal illness (AGI) in the Inuit community of Rigolet, Canada. Three census cross-sectional surveys (n=226-246) captured data on AGI, drinking water use, and water storage (2012-2014). Bacterial contamination of household drinking water was assessed alongside the 2014 survey. Concerns regarding taste, smell, and colour of tap water were associated with lower odds of consuming tap water. The use of transfer devices (e.g. small bowls or measuring cups) was associated with household water contamination. No water-related risk factors for AGI were identified. Results of this study are intended to inform safe water management practices, as well as contextually appropriate drinking water interventions, risk assessments, and public health messaging in the Arctic. Click here to access Carlee's Thesis. Castleden, H., Hart, C., Cunsolo, A., Harper, S.L. and Martin, D. (2017). Reconciliation and relationality in water research and management in Canada: Implementing Indigenous ontologies, epistemologies, and methodologies. In Water Policy and Governance in Canada (pp. 69-95). Springer International Publishing. Click here for access. Water-related issues disproportionately affect Indigenous communities in Canada. Despite millions in investment, Western-trained scientists, engineers, and other researchers as well as the government agencies that have constitutionally-mandated fiduciary responsibilities to address such issues have been rather unsuccessful in solving them. This has been due, in large part, to an overreliance on methods of Western science and management, ignoring the vast place-based wisdom of Indigenous knowledge systems and relational practices regarding water found across the country. The underlying reasons for this partiality are not innocuous; entrenched colonial and racist policies, programs, and practices have persisted across time and space. In recent years, there is increasing recognition of the importance of applying Indigenous approaches to water challenges in Canada. But strategies for successful implementation are only beginning to emerge. In an attempt to respond to this knowledge gap, our research has sought to systematically identify and assess how both Indigenous and Western ontologies, epistemologies, and methodologies have been implemented in water research and management. In doing so, this chapter identifies some of the most promising practices in Canada. We share these with the goal of contributing to processes of reconciliation and responsibility towards each other as well as our roles as water stewards across the country.